Researchers used an optimized computer program to classify sound into three categories in classroom audio recordings. Researchers at San Francisco State University have developed a tool that for the first time can measure the extent to which instructors use innovative teaching methods by analyzing simple audio recordings of classroom sounds, according to a study published today in the Proceedings of the National Academy of Science. Researchers analyzed recordings of more than 1,486 sessions from 67 different courses using the tool, dubbed DART―decibel analysis for research in teaching. “The breakthrough here is that for the first time we can effectively and inexpensively measure the use of innovative teaching strategies that have previously been shown to produce better learning than lecture only,” said SF State Professor of Biology Kimberly Tanner, principal investigator on the study. Tanner’s research focuses on novel teaching strategies. The findings are based on a comprehensive SF State project that includes 83 community college and university instructors involved in examining and promoting innovative teaching methods. Tanner says DART can be used in any classroom, and at this time it's free and can be accessed online at http://dart.sfsu.edu/. SF State researchers have secured a provisional patent for the technology and eventually plan to create an app. According to Tanner, traditional teaching often focuses on a lecture that’s delivered by a faculty member to a group of students. Modern educational research has shown that active learning ― a term used to describe a variety of related methods where students interact with each other and engage in problem-solving activities ― drives stronger learning and better educational outcomes than lecture alone. But widespread adoption of innovative teaching methods that foster increased learning has been slowed by the lack of a way to quantify how much they are really being used by instructors, Tanner said. For example, faculty members can overestimate how often they truly engage students. In addition, educational reform leaders and funding agencies do not currently have easy and efficient ways of monitoring if teaching changes are happening in real-world courses. As part of the SF State research project, faculty members affiliated with 22 colleges and universities recorded their classes, which ranged in size from 4 to 300 students, using standard audio recorders. At the same time, trained evaluators took notes about what happened in the classes and identified the various instructional methods used, including faculty lecture, small-group discussions and quiet problem solving. 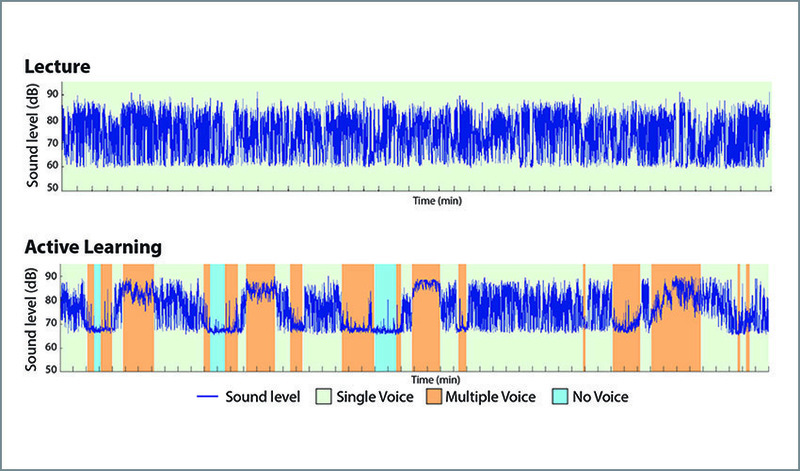 Researchers then used an optimized computer program to classify sound in the audio recordings. Using only the classroom sounds, DART could classify the audio into three categories — single voice (traditional lecture with question and answer), multiple voice (student interactive group work), or no voice (student thinking, writing or individual problem solving) — with over 90 percent accuracy, which matched the ability of the human evaluators to correctly classify the classroom environment. It wasn’t necessary for DART to classify the actual content of the recorded speech, so student and instructor privacy was protected. DART could do its work based solely on the overall level and type of noise in the classroom. The research is funded by Howard Hughes Medical Institute (HHMI) and National Science Foundation (NSF) grant awards. Article #16-18693: “Classroom sound can be used to classify teaching practices in college science courses,” by Melinda T. Owens et al., published in the Proceedings of the National Academy of Science.